HIV. This is a disease that 1.1 million people in the United States are currently living with and is also known for many devastating outcomes. In the early stages, HIV, or human immunodeficiency virus, is commonly associated with fevers, chills, rashes, fatigue and muscle ache. As the disease progresses, the symptoms only worsen, especially after the progression to AIDS (acquired immunodeficiency syndrome). These symptoms include rapid weight loss, night sweats, sores, pneumonia, extreme tiredness, and depression. What many people do not realize is that these are not the only challenges that come along with a diagnosis of HIV. One of the major issues that these individuals face is a complex neurological problem, also known as HIV associated neurological disease. HIV associated neurological disease, or HAND, describes cognitive impairments that individuals with HIV face, and while it is not one of the more commonly discussed issues, the consequences can be dire. Some of these difficulties include slowed processing, deficits in memory and attention, issues with fine motor control and behavioral changes. The most commonly reported issues and the ones with the most significant impacts are with executive and motor skills, as well as information processing. There are two different classifications of HAND: HIV associated mild neurocognitive disorder (MND), and the more severe HIV associated dementia (HAD). To be diagnosed with MND, an individual must have symptoms that impair their daily functioning, and either they or someone they are close to must have observed reduced mental acuity, and challenges in work, at home, or in social functioning. For a diagnosis of HAD, there must be impairment in at least two different cognitive domains, and these impairments must significantly impact their daily functioning. One question that you might be having is why do cognitive impairments even occur if HIV infects immune cells? Does it also infect neurons themselves? 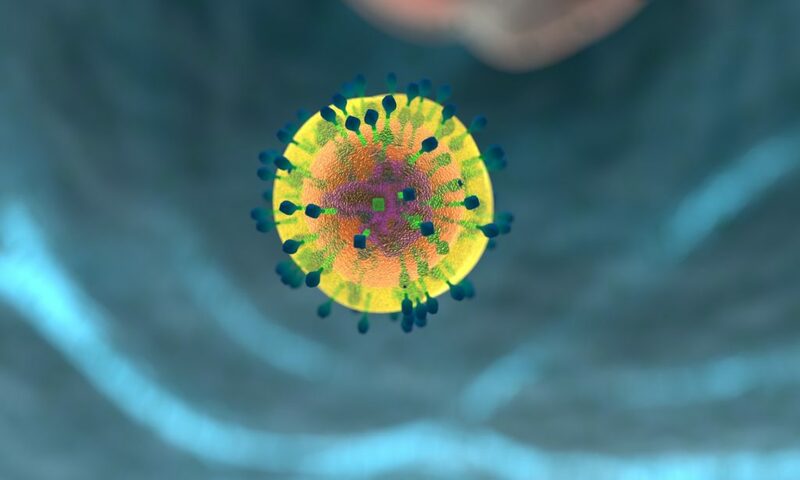 The reason why HIV is commonly associated with neurological issues is due to the fact that infected immune cells are able to travel across the blood-brain barrier as early as a hours after infection. These infected immune cells release different chemicals that are able to induce neural apoptosis or cell death. This is linked to reduced volume of the hippocampus and frontal lobe, which has been connected to neurocognitive impairment. On top of this, HIV is linked with spinal cord and peripheral nerve pathology that could be linked to these impairments as well. While this may seem like a very bleak diagnosis, all hope is not lost. There are medicines that can be used to help treat HAND. Most of these treatments are aiming to achieve viral suppression, minimizing the impacts of HIV on the body as a whole, and not specifically the cognitive issues. The benefits that these medicines are expected to have include increased concentration, alertness and memory. In addition to these medicines, there are also non-pharmacological treatments that can be used, the most important method of which is living an all-around healthy lifestyle. This includes a healthy diet, physical activity, and mental and social engagement. It is also very important to make sure that the individual gets a good amount of sleep, as disruptive sleep is known to impact memory and thinking. Anand, P., Springer, S. A., Copenhaver, M. M., & Altice, F. L. (2010). Neurocognitive Impairment and HIV Risk Factors: A Reciprocal Relationship. AIDS and Behavior, 14(6), 1213-1226.